This article is about the village in Cheshire. 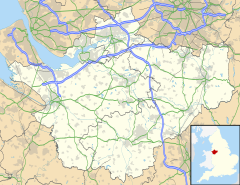 For the town in Greater Manchester, see Ince-in-Makerfield. For other uses, see Ince (disambiguation). Ince is a village and civil parish in the unitary authority of Cheshire West and Chester and the ceremonial county of Cheshire, England. It is situated immediately to the east of the Stanlow Oil Refinery. It shares Ince & Elton railway station with the village of Elton, which it runs into. According to the 2001 Census, it was recorded as having a population of 209. Ince Park is being developed near the village. The name Ince, first recorded in the Domesday Book as Inise, is from the Primitive Welsh ïnïs, meaning "island". The name refers to the village's position on a low ridge in the marshlands around the rivers Gowy and Mersey. Ince was an ancient parish in Eddisbury Hundred and became a civil parish in 1866. The civil parish was abolished in 1950, and absorbed into Ellesmere Port civil parish. The population stood at 443 in 1801, 422 in 1851 and 290 in 1901. The present civil parish was separated from Ellesmere Port in 1987, with smaller boundaries. Ince & Elton railway station, serving both Ince and Elton villages. Ince & Elton railway station serves both Ince and Elton villages, but it is just within the Elton boundary. There are infrequent Monday to Saturday services to Ellesmere Port, Stanlow & Thornton, Helsby, Liverpool Lime Street, and Warrington Bank Quay. The nearest station with better services and facilities is either Ellesmere Port or Helsby. The X2 bus visits Ince hourly in each direction and operates from Chester bus station with a destination of Runcorn. The service is operated by Stagecoach Merseyside & South Lancashire and is supported financially by Cheshire County Council. Ince also has a few morning and evening journeys on service DB8 to Chester Business Park. Public transport in Ince is supported by the North Cheshire Rail User Group. It campaigns for better rail services and improved public transport interchange. ^ "2001 Census: Ince (civil parish)". Office for National Statistics. Retrieved 12 February 2008. ^ a b "Cheshire Towns & Parishes: Ince". GENUKI UK & Ireland Genealogy. Retrieved 20 April 2008. ^ "The Website of the North Cheshire Rail Users Group". Ncrug.org.uk. Retrieved 2016-01-13. This page was last edited on 25 February 2018, at 00:00 (UTC).